The hike adventure was done. Key West had welcomed me with its warm tropical breezes and patented Florida Sunshine. But now it was time to unwind the logistical tangle. I am a serial day hiker. I had accomplished the hike self-supported with two vehicles. Back in early October I had started the hike by getting those two vehicles into position, now it was time to get them back home from Key West. Home, in this case, would be an interim base before starting another hike. My Keystone Heights, Florida home remains a project on hold until the mega-hike is finally finished. I would settle back into my old condo at the beach at Topsail Island. 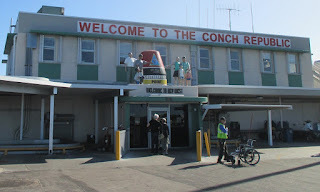 So step number one was to park one vehicle securely in Key West and drive the one thousand miles to Topsail. My Key West motel was kind enough to allow me to keep the car there. The drive to Topsail took me sixteen hours, accomplished in one marathon drive. Step one accomplished. The homes I choose are all near public airports. My Topsail condo is 37 miles from Jacksonville's Ellis Airport. Step two was to fly back to Key West. The flight was not expensive. One night in my motel room in Key West cost considerably more. But the trade-off was that the flight had three segments--two plane changes. 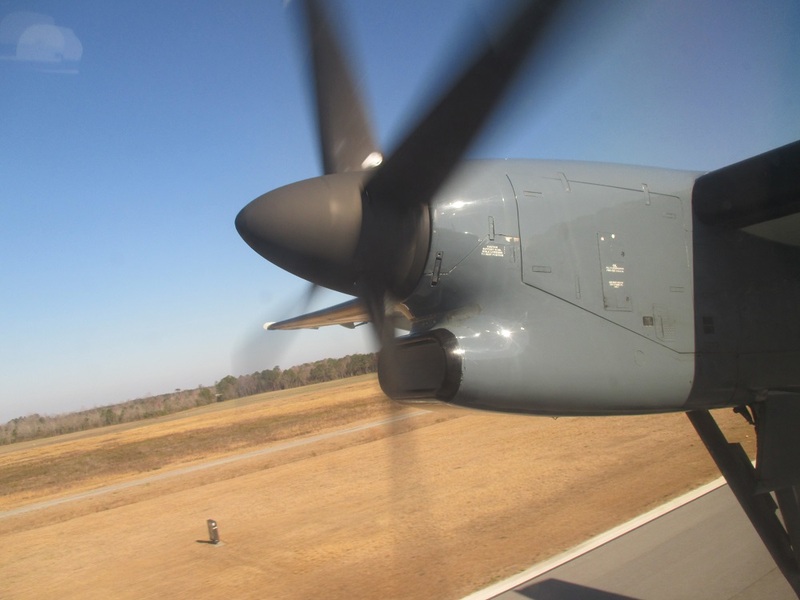 First I flew a prop plane from Jacksonville to Charlotte, NC. That explains the headline photo. 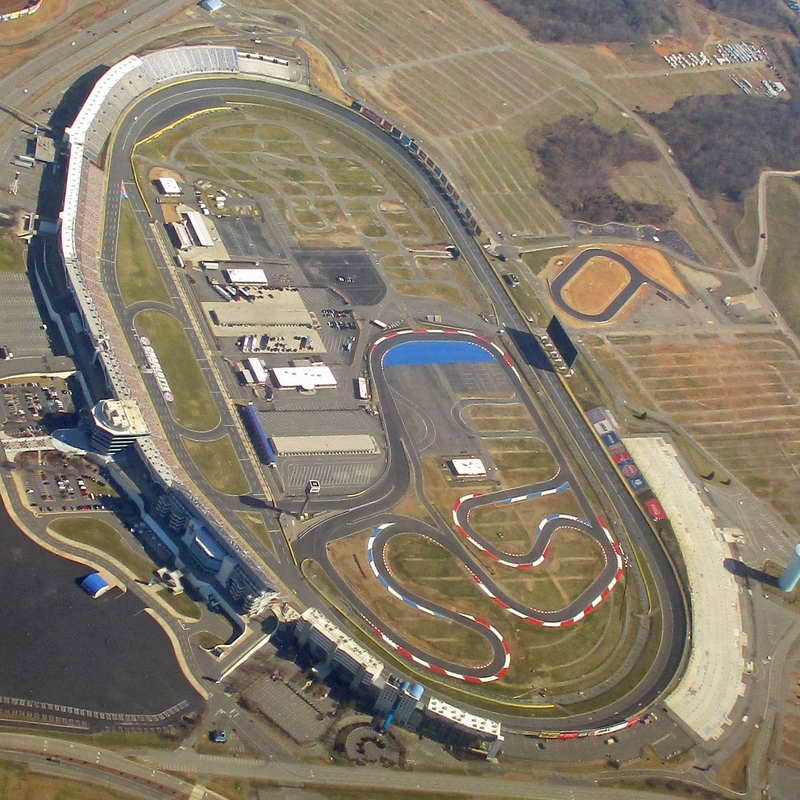 As we approached Charlotte we passed right over the nearly 100,000 seat Charlotte Motor Speedway. The plane change went smoothly and next I was aboard a big jet bound for Miami with not a single seat empty. 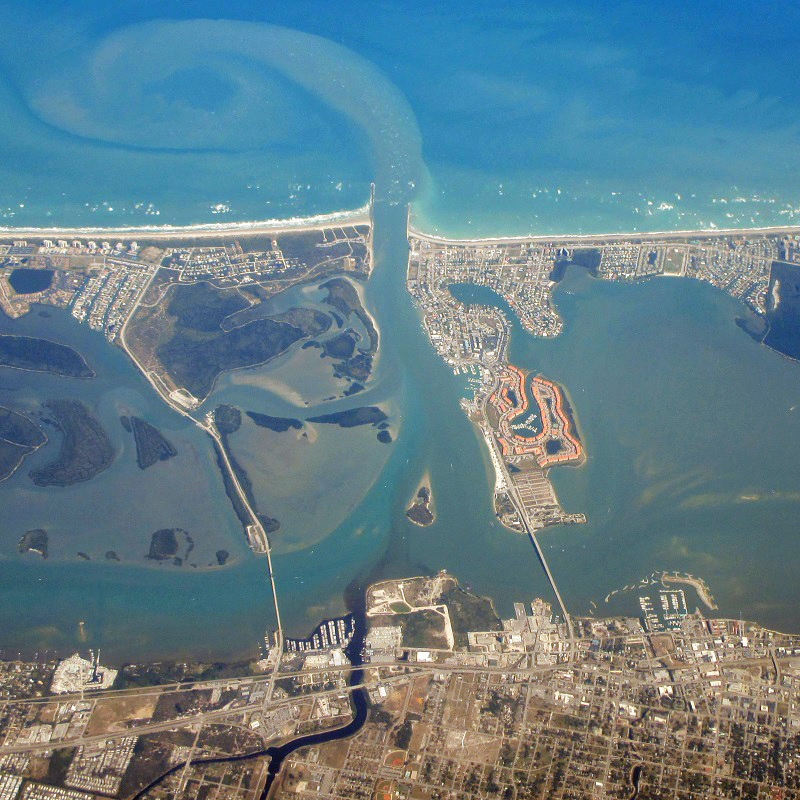 It flew down the Florida Coast and I got a birds eye view of nearly the entire beach strand that I had just hiked. 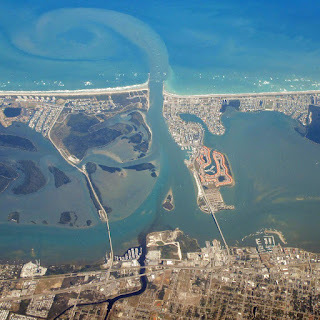 Here's a view of the Fort Pierce Inlet--the one place I had to leave the beach, hike inland over the Intracoastal Waterway, and then head right back out to the beach again--North Hutchinson Island to South Hutchinson Island. 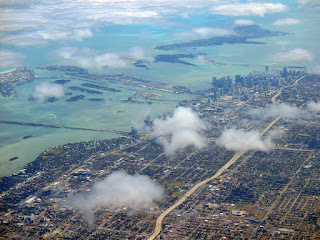 As we approached Miami Airport the city skyline was spread out before me, with Miami Beach to the left and Key Biscayne behind. I had an hour to stroll the gigantic Miami airport before boarding the flight to Key West. This was a small jet and was only half full. 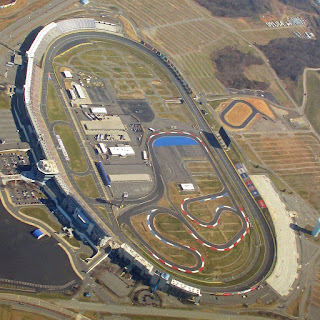 Again we flew over many of the memorable venues I had just hiked. 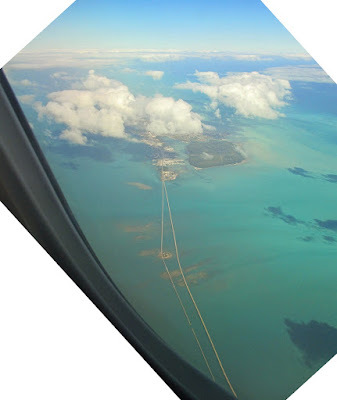 Most prominent among them was Pigeon Key and the Seven Mile Bridge. 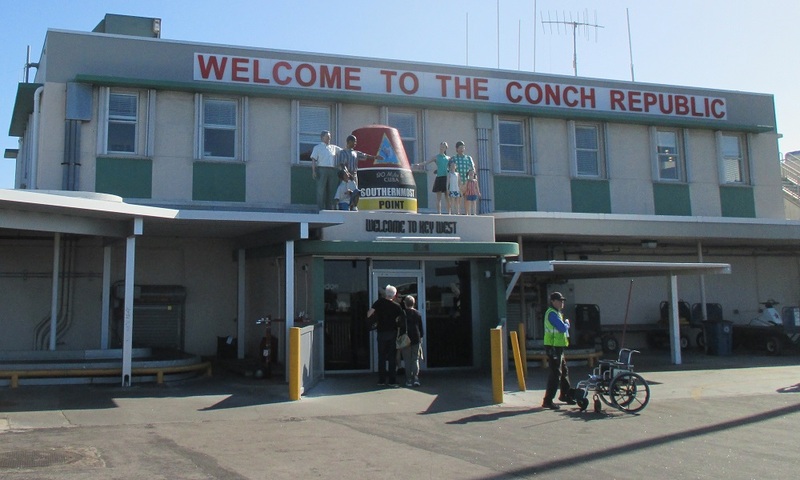 And then I was there, basking once more in the tropical breezes at Key West airport. It's a typical tropical island airport - you walk the tarmac under the open sky from the plane to the terminal. Cute terminal entrance, no? Mannequins surrounding a replica of the monument that had been my destination. Very appropriate. So what did I do? I walked straight in that door and out the other side, less than a half mile to my car parked at the motel. I got in the car and left, driving the length of the Keys before sunset and on north to Topsail by noon the next day. Twenty eight hours after I pulled out of the parking lot at my condo development in Topsail to go to the airport I was back there. I still had one last step to complete--retrieving the other vehicle from the parking lot at the Jacksonville airport. I did those 37 miles on my bicycle on a hot summer-like day - every bit as warm as the weather I had been enjoying on the Keys. Spring was gushing northward on a strong southerly wind. Now that the "Key West or Bust" adventure is finished, I'm hard at work planning the next one. "Colorado or Bust" will extend my Personal Continuous Footpath from the Appalachian Trail to my graduate school homes (1970 to 1980) in the foothills of northern Colorado. I hope to get there before the fall. Stay tuned.